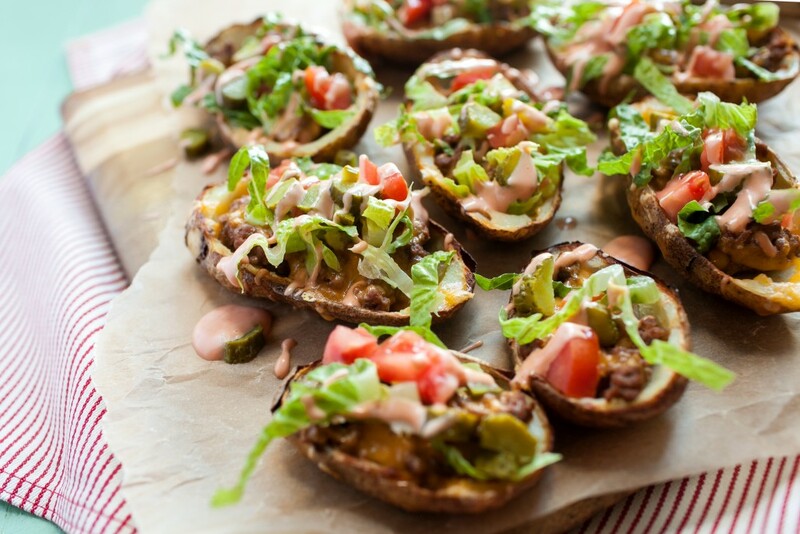 Loaded Potato Skins stuffed with ground beef and American cheese! What could be better? Poke holes in potatoes with a fork, and place in oven. Bake for 45 minutes, or until a fork easily pierces through potato. Remove from oven and place on wire rack to cool for 10 minutes. While potatoes are baking, sauté olive oil and onion in a skillet over medium heat. Cook 2-3 minutes, or until onion is translucent. Add ground beef and stir, breaking up meat, until cooked through. Add ketchup, mustard, garlic powder, salt and pepper and mix. Set aside. Cut potatoes in half lengthwise and scoop out insides, leaving about 1/4 inch intact. Place on parchment-lined baking sheet. Brush both sides of potatoes with butter and sprinkle with salt and pepper. With potatoes skin side up, place under broiler for 2-3 minutes, or until skin becomes crispy. Flip potatoes over and broil the other side for 2-3 minutes. Remove potatoes from oven and fill each potato skin with equal parts ground beef mixture. Top with 1/2 slice of cheddar. Return to broiler for 1-2 minutes, or until cheese has melted. Top with lettuce, tomato and pickle. Mix together ketchup and mayonnaise and drizzle over top to finish. Serve immediately.